The actor Bandô Mitsugorô III performed in the 9th lunar month of 1820 at the Nakamuraza a 7-role hengemono, which was entitled "Setsugekka Nagori no Bundai". It was part of his onagori kyôgen for he was about to depart from Edo to play in Ôsaka. Three of these seven roles survived. One of these three roles, the hare, became the independent dance "Tama Usagi". In Japan, it is fabled that the forms seen on the moon are hares pounding rise cakes. 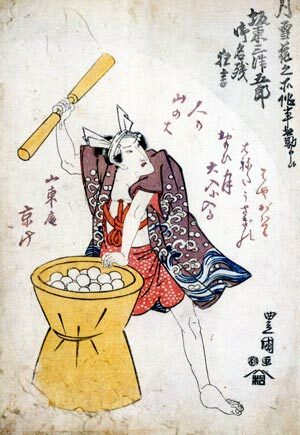 In this performance a hare who jumps off of the moon onto the Earth is pounding rice cakes to a light-hearted lilting tune. Next,the hare becomes the hare from another famous Japanese fable, the "Spiny Mountain" and,in accordance with this fable, has a scuffle with the raccoon. This is an innocently witty dance that is well-known through fairy tales and children's songs.